I feel like Christmas and New Year’s Day should fall on a weekend more often. Because I don’t know about you, but there’s been something about the holiday season this year that has just felt more slow and restful than usual. Maybe it’s the fact that everyone I know has had two four-day-weekends off in a row, easing us all into the workweeks a little more gently. Or maybe it’s just that we’ve all finally been able to take in a deep breath of relief, knowing that after a rough 2016, a fresh start with 2017 has finally arrived. Whatever the reason, I feel like my friends and I have all been enjoying the gentler start to the new year this week. And I’m feeling extra light and refreshed thanks to a lineup of healthier homemade meals that I’ve had on the menu this week, including this wonderfully comforting and delicious Moroccan Chickpea Soup. 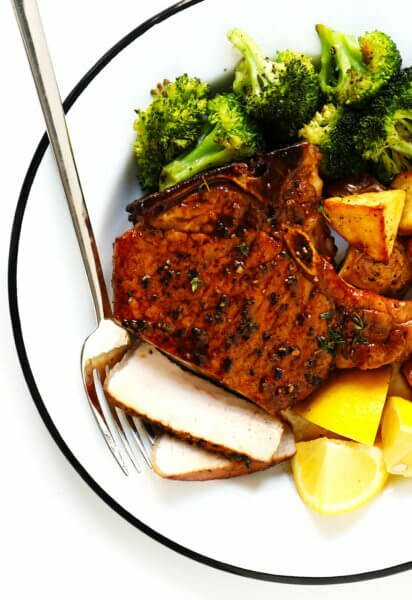 It has been on my list to make for weeks after trying it at a friend’s house this fall, where I fell in love with the amazing seasonings and fresh flavors. (Plus the fact that it’s naturally gluten-free, vegetarian, and vegan, so everyone at our table could enjoy it.) So when I was brainstorming a quick and easy recipe to enjoy on this chilly winter week in Kansas City, it seemed like the perfect way to begin a new year. 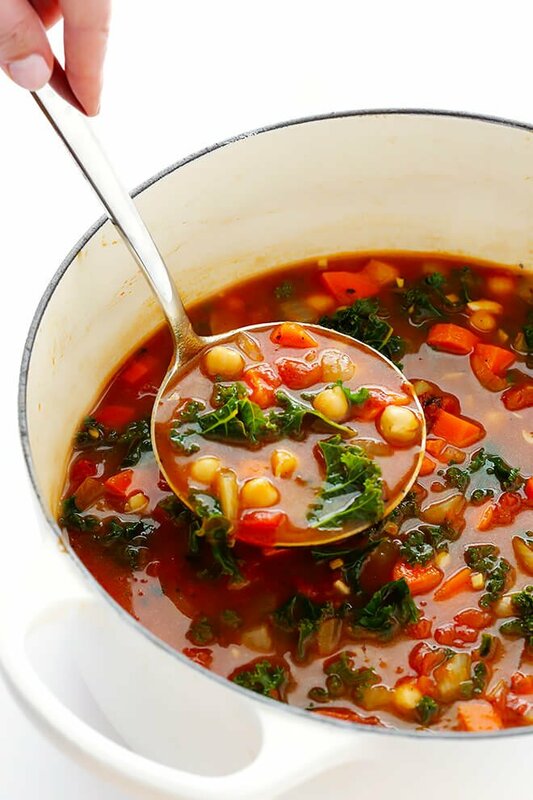 …and this vibrant, delicious, feel-good pot of soup will be yours to enjoy in just about 20 minutes or so. Seriously, this soup is incredibly easy to make, and in my experience, it totally hits the spot. 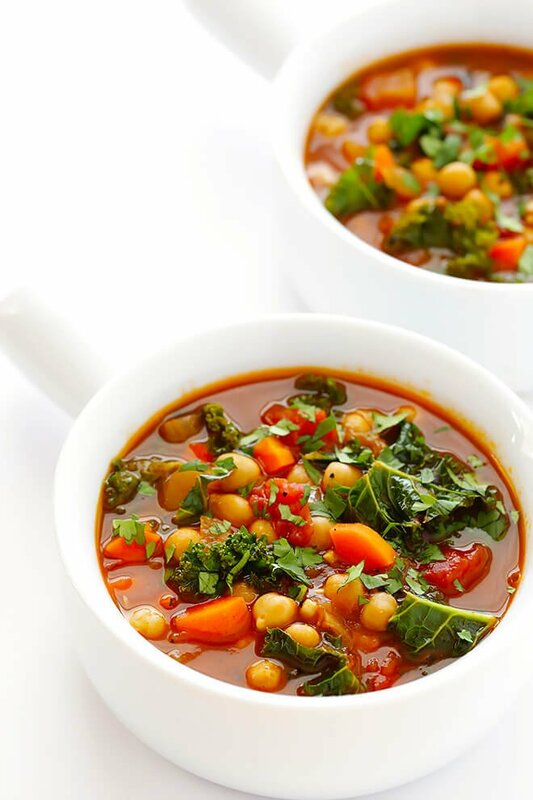 This Moroccan Chickpea Soup recipe is naturally vegetarian, vegan and gluten-free, it’s super easy to make, and it’s full of so many rich and delicious flavors. 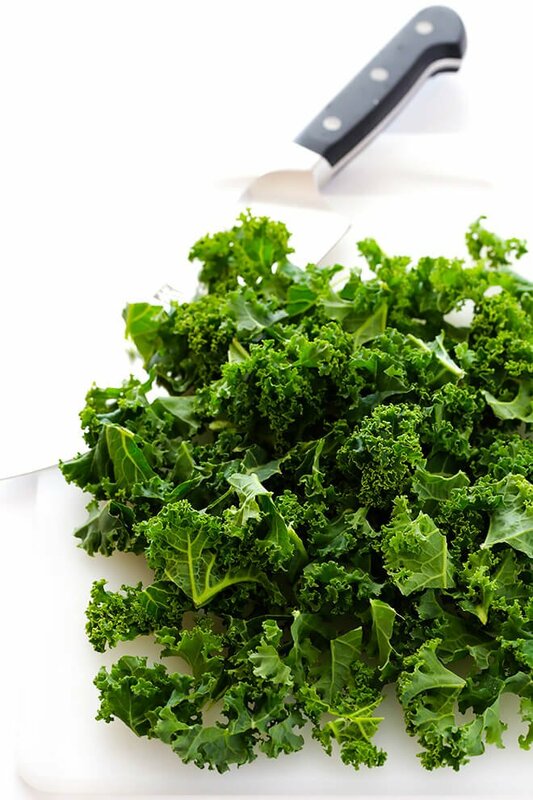 Reduce heat to medium-low, and stir in the chopped kale. Continue simmering for 3 minutes until the kale has slightly softened. Serve warm, garnished with fresh cilantro and served with a fresh lemon wedge. 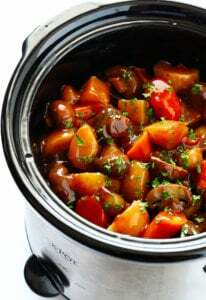 This recipe can also easily be made in the slow cooker! 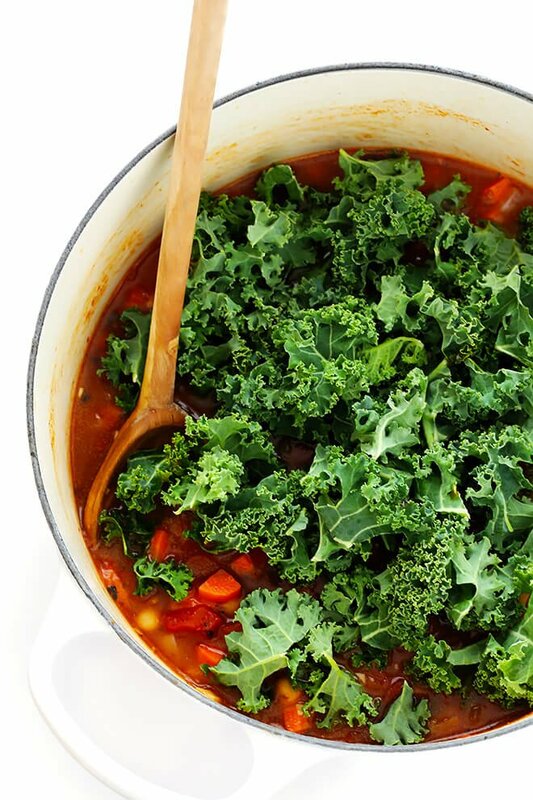 Just add all of the ingredients minus the kale to a large crock-pot and cook on low for 6-8 hours, or on high for 3-4 hours. Then once you’re ready to serve, stir in the kale and let it rest for about 3 minutes. And serve warm, garnished with fresh cilantro and served with a fresh lemon wedge. I loved my Christmas holidays. I agree with you – they should always be on weekends because the chill metre was especially high this year! This soup looks super appetising. Perfect for a cold night. This is a great soup for January! 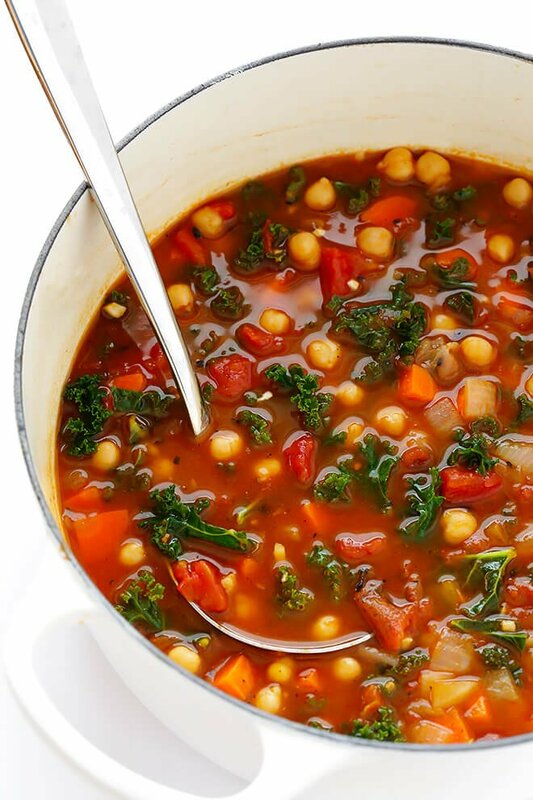 :) I like chickpea a lot and I love soups so putting this on my To-make-soon list! This is so perfect for January, Ali! I love that it’s healthy but filling- just what I need buried in all of this snow (I’m in Utah). I definitely want to try this :) P.S. I wrote you a comment on IG but seriously CONGRATS on the engagement! So excited for you and Barclay! I am not normally so stoked for someone I don’t actually know but I feel like I’ve been following along with your adventures and know y’all as a couple– couldn’t be more thrilled! Thank you, Christine! We hope you enjoy it! What an exciting pot of soup!! These flavors are so different from what I usually put together. I think it’s time to make this. Yum! That looks so delicious & healthy! Thanks, Carlos — we hope you enjoy this! Can this be frozen once the kale has been added? I would love to make a big batch and then freeze it. Thanks! Hi Michelle — we think that should be fine, we hope you enjoy! Just made this for lunch today! 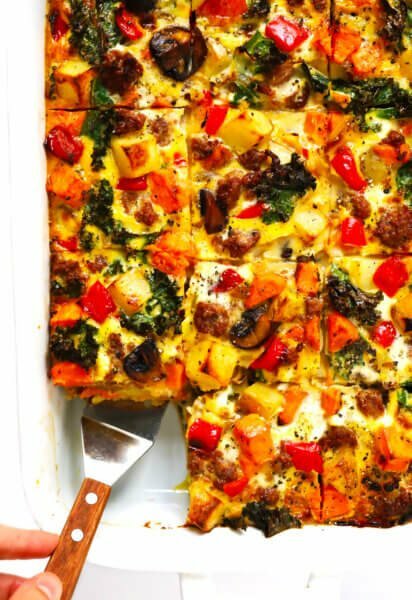 Perfectly easy, hearty, and healthy on a cold winter day. We’re so happy you enjoyed it, Karen! Readers: don’t let the presence of ginger be off-putting. It’s very common in — and necessary for — true Moroccan cooking. Along with the cumin, it’s not-to-be-believed-good. But in this house, no kale. Spinach to the rescue!!!! Hi there! So excited to make this soup for dinner tonight with some tasty lemon-garlic chicken drumsticks on the side. Quick question – are the chickpeas drained and rinsed or do you just throw the whole can in there. Thanks! Hi Jessica — we drain and rinse them. We hope you enjoy the soup! This soup is AMAZING! I cannot recommend it enough. It’s quick, filling and makes for fantastic brown bag lunches. Thank you, Ali! 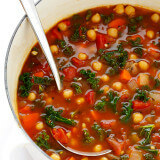 Love your recipes, one question on this Moroccan soup recipe, do I drain and rinse the chic peas ? Whoops, just realized that I forgot to note that in the recipe. The chickpeas should be rinsed and drained right out of the can before adding them to the soup. Enjoy! Thank you, Margo — we hope you enjoy this! Can I substitute the kale with spinach? Made this soup today for lunch and it is delicious! Thanks for the easy recipe. My wife and I live in KC and have tried several of your recipes recently (Chicken Enchiladas, Potato Soup, both great) – really like your site! Thanks again. Hi! I made this soup earlier this week and WOW, I was surprised at how delicious it was. I was a little reluctant to add the crushed red pepper flakes (I can’t handle spicy) and cinnamon (on a soup? it was a first for me), but I’m glad I did. I’m trying to have a healthier diet so I will be making it more often, along with some of your other recipes. Thank you. This was absolutely delicious. I’m looking forward to trying some more of your recipes. Very tasty and easy to make! So happy we came across your website via buzzfeed food. Made this soup this evening. I didn’t have any canned tomatoes so I used some ripe fresh ones I had in the fridge. The other thing I used was frozen spinach instead of kale. It was so tasty. Loved the spices and the combination of fresh coriander and lemon at the end. It really is the basis of a good soup–depending on the season you could add other vegetables that are available. I was just thinking of zucchini in summer, mushrooms in autumn. Very tasty! Thank you for the recipe! This soup is a favorite with everyone I have served it to. So healthy! Perfect! Great recipe, as advertised! Used crock pot, served with vegan cornbread. Awesome & thanks!